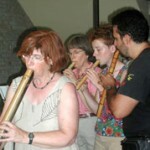 Music-making and camaraderie at home are enhanced by contact with other pipe makers and players from abroad. 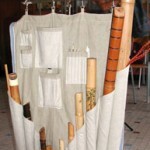 A “wind organ” made of bamboo pipes along the Dutch coast. 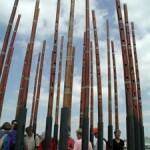 The sound is produced by the wind blowing over the ends of the poles, much like blowing across the top of a bottle. 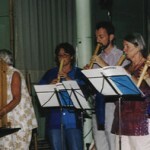 Members of the Dutch Pipers guild play pipes accompanied by a bamboo organ. 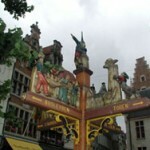 Some American pipers sadly leave the international course in Mechelen. 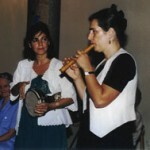 The audience enjoys hearing players from Greece, the Netherlands, Switzerland and the U.S. perform together. 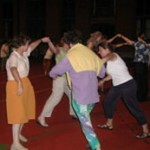 Americans teach people from many countries how to square dance at the workshop in Mechelen. 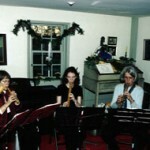 American pipers play during a Holiday Open House in December 2001 at the Buckman Tavern in the room where the Minutemen met before the battle of Lexington. 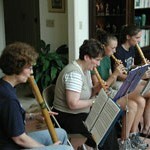 Pipers have played at open houses in Lexington for over 15 years. 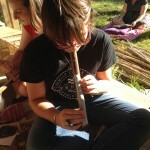 Piping at the Community Music School Teen Celtic Camp in Santa Cruz, CA. 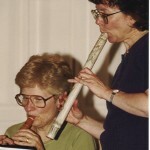 As well as the group on the east coast of the US, Shelley Phillips actively teaches piping to both adults and youngsters in the Santa Cruz, CA area.